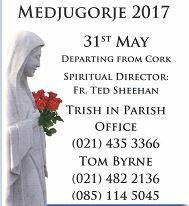 For further details on the Parish Pilgrimage to Medjugorje please contact Trish in the Parish Office on 021 4353366. This entry was posted in Parish News. Bookmark the permalink. Webcam at Sacred Heart Church, Glounthaune.